RECIPE TITLE "Arugula with Parmesan"
... more great recipes from Barefoot Contessa on our GREAT CHEFS page! When I'm having a dinner party, I try not to cook more than two things; I'll assemble the rest. That way I don't spend the evening standing in front of the oven fretting, "Is it done?" This is an easy salad to assemble as a first course. The arugula is peppery, the vinaigrette lemony, and the Parmesan spicy. Prepare the ingredients in advance and just toss them together before dinner. Serve with a wedge of lemon if you like. Since this recipe has very few ingredients, it depends on using the best for its flavor. I always choose aged Italian Parmesan (Parmigiano-Reggiano) cheese. Barefoot Contessa Back to Basics: Fabulous Flavor from Simple Ingredients is the essential Ina Garten cookbook, focusing on the techniques behind her elegant food and easy entertaining style, and offering nearly a hundred brand-new recipes that will become trusted favorites. 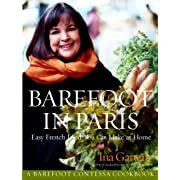 Ina Garten’s bestselling cookbooks have consistently provided accessible, subtly sophisticated recipes ranging from French classics made easy to delicious, simple home cooking. 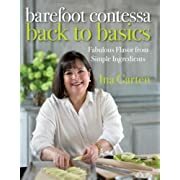 In Barefoot Contessa Back to Basics, Ina truly breaks down her ideas on flavor, examining the ingredients and techniques that are the foundation of her easy, refined style. Here Ina covers the essentials, from ten ways to boost the flavors of your ingredients to ten things not to serve at a party, as well as professional tips that make successful baking, cooking, and entertaining a breeze. The recipes--crowd-pleasers like Lobster Corn Chowder, Tuscan Lemon Chicken, and Easy Sticky Buns--demonstrate Ina’s talent for transforming fresh, easy-to-find ingredients into elegant meals you can make without stress. For Ina, it's friends and family-gathered around the dinner table or cooking with her in the kitchen-that really make her house feel like home. Here Ina offers the tried-and-true recipes that she makes over and over again because they're easy, they work, and they're universally loved. For a leisurely Sunday breakfast, she has Easy Cheese Danishes or Breakfast Fruit Crunch to serve with the perfect Spicy Bloody Mary. For lunch, she has classics with a twist, such as Tomato, Mozzarella, and Pesto Paninis and Old-Fashioned Potato Salad, which are simply delicious. Then there are Ina's homey dinners-from her own version of loin of pork stuffed with sautéed fennel to the exotic flavors of Eli's Asian Salmon. And since Ina knows no one ever forgets what you serve for dessert, she includes recipes for outrageously luscious sweets like Peach and Blueberry Crumble, Pumpkin Mousse Parfait, and Chocolate Cupcakes with Peanut Butter Icing.